"Love hurts. There is nothing as painful as heartbreak. But in order to learn to love again, you must learn to trust again. When a mysterious young woman named Katie appears in the small town of Southport, her sudden arrival raises questions about her past. Beautiful yet unassuming, Katie is determined to avoid personal ties until a series of events draws her into reluctant relationships. Despite her reservations, Kate slowly begins to lower her guard, putting down roots in the close-knit community. But even as Katie starts to fall in love, she struggles with the dark secret that still haunts her..."
I hope you are having a wonderful day so far. This is 100% a long overdue book review. I read this a while ago now and it has taken me so long to just sit down and write a review of it, even though I loved it so much that I recommended it to everyone as soon as I read it. I absolutely love Nicholas Sparks films, they are definitely my favourite films of all time including Dear John, Safe Haven, The Last Song and The Lucky one. Obviously there are so many more and all of these he wrote as a book too. When I watched Safe Haven when it came out on dvd, I fell in love with "Katie" and Alex was absolutely gorgeous, I mean, who doesn't love the look of Josh Duhamel? This is one of my favourite films because the story line is absolutely incredible, beautiful and breath taking but it did make me cry. The fact it made me cry, made me want to read the book afterwards because I am one of those irritating people that prefers to watch the film and then read the book and compare. I'm sorry! However, I knew I would instantly love this book before even reading it, because I already knew the story line. After picking up this book, I read it within two days which is absolutely insane, but that's how much I enjoyed it. I really didn't want to put it down and I read 25 chapters in one day just so I could finish the book which is crazy, I know! This was the first Nicholas Sparks book I ever read, however I did purchase them all at the same time (well nearly all of them), and I knew it would be a novel I could really get my teeth stuck into. What I love about Nicholas' writing style is how realistic he makes the story. Obviously fiction books are not real, we all know that but to be able to read a book and actually see the story in your mind, is definitely a book worth reading and reading until it's finished. The characters in this book are so easy to relate too because it's a realistic topic which occurs in real life nearly every day. This story line happens to so many people and it's wonderful to see it put into a book. Nicholas' writes in a way which makes you feel like you're actually there in Southport, basically as the character "Jo", you're there, but you're not really there. You go through every bad and amazing situation that Katie goes through and you end up in tears after reading one chapter and finding out what happens along the way and I LOVE this! Nicholas reminds you how although a past can haunt you for such a long time, he also shows you how you can get yourself out of a situation if you really want too. Also, as the blurb mentions, heart breaks are so painful, I definitely know this and have experienced it. But you love again, you need to learn to trust again and he shows how this can be done in this fantastic story of Alex and Katie. Everyone has baggage and everyone has trust issues whether these are tiny or fairly big but if you love someone, you can see straight past all them issues and only see the person right in front of you. Re-reading the last page makes me cry with happy tears, even when I haven't re-read the whole book, it's so beautiful! This book is definitely romantic yet realistic of the real world and that's another point I love about Nicholas' writing style, he relates every story to the real word, even if it only a story. Would I recommend Safe Haven? 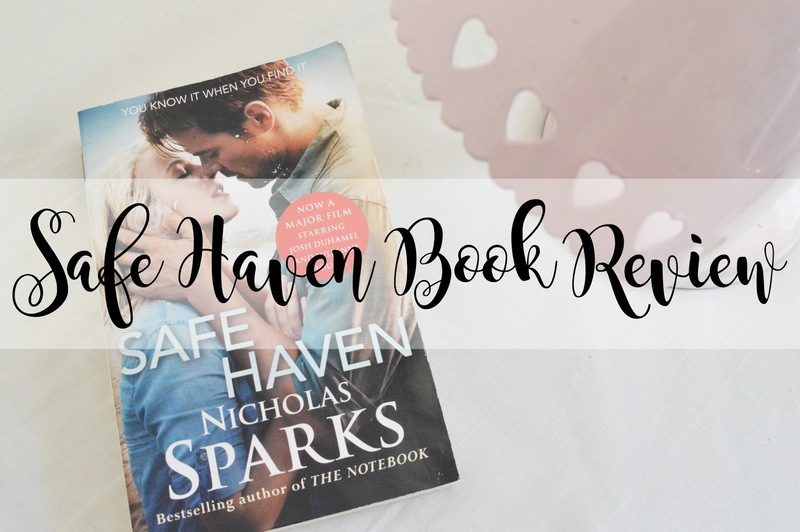 If you are reading this, I recommend Safe Haven to you. It's is an incredibly beautiful book which will make you cry with happiness and sadness. You will see the beauty of Katie and Alex and understand how far anyone would go to find the happiness they deserve. You will not want to put this down once you have picked it up. Would I re-read Safe Haven? Always! I am completely and utterly in love with the story, the film is also just as amazing and if I have to cry, I'd want to cry while reading this book! Definitely a 5. Nicholas couldn't have made this book any better than what it is. The ending is the best ending of a book you will ever read, it's very real and very relatable. It's a story you never want to stop reading. Let me know if you have read this book and what your thoughts were on it. Did you love it? Did you hate it? Is there anything you expected to happen but didn't? Also let me know if you enjoyed this book review and if you want to see more! I really enjoyed reading this! I haven't read the book but I've seen the movie and I absolutely loved it. I totally agree with what you said about Nicholas Sparks, I love how he creates a romantic beautiful sotry based on realistic facts. I love it.